Vintage-y goodness around the blogosphere! I’ve been friends with fellow blogger Lynn, of Lynn’s Book Blog for years. We started commenting on each other’s blog, and before we knew it we were doing read alongs together and plotting to take over the world! Okay, not that last part. Well, maybe a little. In today’s guest post, Lynn talks Stainless Steel Rat, and how she got started reading more speculative fiction. Crime, con artists and capers in outerspace? sign me up! This month I’m reading some Vintage Sci Fi for Little Red Reviewer’s Vintage Sci Fi month – which also dovetails quite nicely with Stainless Steel Droppings Sci Fi Experience. Basically, it’s a bit like cheating – you read one book and it counts for both events. Win. We all love a cheat – don’t deny it! It’s like finding a short cut or a bargain – it makes you happy! 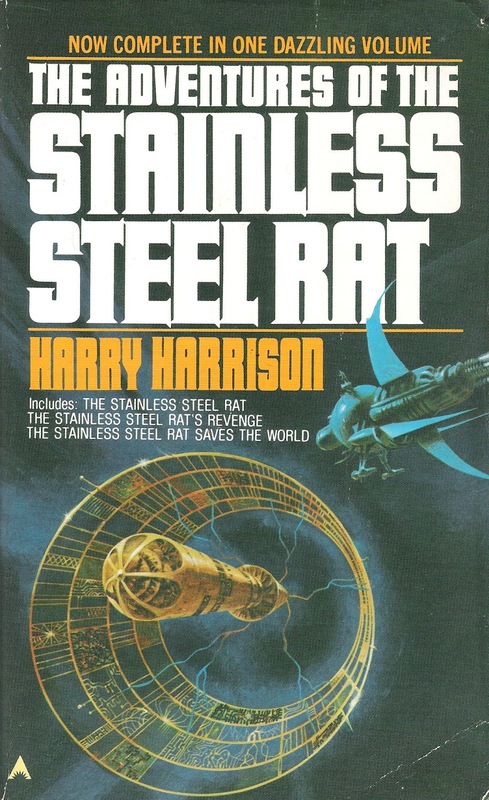 I’ve read a few sci fi books already but the first that I can put towards my Vintage event is Stainless Steel Rat by Harry Harrison. I did think about writing a little introduction about the author but, to be honest, I’m probably not the best person to do that. This is my first reading experience of this author and so to start waxing lyrical would just be plain silly – there are plenty of people out there who could really do him justice rather than me just regurgitating facts from Wiki! The reason I chose this book? To be honest I don’t read much sci fi and that’s something I like to address. To be even more honest the reason for this is because I find it a little bit daunting. Basically sci fi scares the pants off me because I think I’m not going to understand it! I mean, it’s not like I’m a raging dunce but I hold my hands up that maths and science are not my forte – and I don’t want to read a book that makes me feel ridiculously stupid (is that bad?). When I started blogging, one of the first blogs that I came across was Stainless Steel Droppings (followed by Little Red Reviewer). I’ve been following these blogs for quite some time now and in doing so I’ve read books that I frankly would never have picked up, I’ve read books that the cover alone would have had me walking out the shop!, I’ve read a few classics and I’ve taken part in readalongs that meant the subject of the book was dissected in a really fun way. Carl, over at Stainless Steel Droppings named his blog so because he has loved this author since being a young boy first stepping into the sci fi realm. I really like that sort of thing and so I thought I’d read this book to find out for myself just how good these books are. After all, if these books encouraged one person’s love of sci fi then what not mine?? Also, reading a bit about the Stainless Steel Rat its clear that this series is fun with a cheeky rogue being the main protagonist. That all being said, the pressing issue – did I like it and would I continue with the series – yes, and yes! 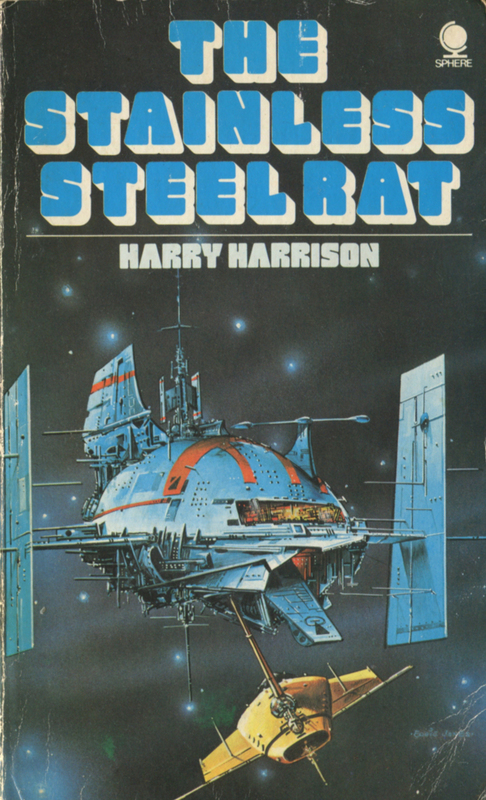 The Stainless Steel Rat was the first in the series (although I think there have been prequels written since). The book sets off really well with Jim diGriz going from one crime caper to the next. The reason why this is so unusual is that crime has virtually been eradicated in this future world. Genetic tampering (presumably) has removed the trait and so there are very few master criminals working the stars, not to mention the crime enforcers are poorly placed to deal with such crime. Jim has little respect for the law and his lofty attitude is in a sense his undoing. He finds himself in a situation where he’s being chased and in attempting to escape capture is actually being manoeuvred into a trap – he’s used to being the one who’s always one step ahead. This isn’t a spoiler by the way – basically Jim is caught by the Special Corps – their aim (to boldly go maybe) to recruit master criminals and use their cunning and wily ways to catch others! A thief to catch a thief – not a bad plan. And so Jim starts his probation with the Corps and in true probationary style he finds himself doing the humdrum work that nobody else wants to do and checking records and data. This is where he uncovers his first job on behalf of the agency. This is a scheme by a criminal who has more than just wealth and comfort in mind. This criminal is not only clever but has little regard for human life and doesn’t think twice about coldly snuffing it out. I’m not going to go into any more about the plot or the other main players because I think this will spoil the gist of the story and the twists and turns that are encountered along the way. What I really enjoyed about this is that the author manages to flip things around so easily. I stopped trying to second guess what was going to happen and there were a couple of moments where I was literally gobsmacked (not a pretty sight) and Harrison manages to do all this in a really accessible, easy to read and fun style. Yes, there are spaceships and war craft and lightspeed and star hopping – but basically this is a story about a conman, a grafter, who’s good at what he does and who is now going to set traps and catch others. Yes, it’s set in the year ‘whenever’, it’s a space opera (and I actually had to go and look at the definition of ’space opera’! I know – doh!!) but, at the end of the day that’s the story. Think of the film Catch Me if You Can – and now dress everybody differently and change the scene to a different planet in a different solar system, throw in some space ships and there you go! Also, the author doesn’t use a lot of description which I think is a really good tactic – I’ve got nothing against description by the way, and for the avoidance of doubt, but it can be quite ageing in sci fi books. Put bluntly, when this book was first written there were so many gadgets not even yet invented that we now take for granted that to try and come up with this in a story would just date it really badly. ‘Rough and touch diGriz, the killer who never killed! It was nothing to be ashamed of, quite the opposite in fact. I placed a value on human life, the one unchanged value in existence’. ‘Being locked in a black room full of corpses had an unusually depressing effect on me’. ‘“Here’s looking at you”’ – yes, I kid you not – that is actually a quote from the book and I love it. I haven’t read any reviews of the next in series because I don’t want the spoilers but I won’t deny I’m really keen to read about what happens next. The ‘baddie’ – who I’m purposely not going to discuss – is very interesting and the ending, which is resolved is also unresolved. There – confused at all – I like to share the confusion? What I mean is it’s unclear what will happen to the character who has been caught at the conclusion of this story and I wonder if this person is going to reappear in future episodes, I think so??? Am I a sci fi convert? I don’t know, I think fantasy will always be my first love, but I really enjoyed this and have also been reading some other similarly good sci fi (such as the Ellie Quinn series by Alex Scarrow). But I admit I’m only just dipping in my toes – nothing wrong with that – you have to start somewhere after all and toes are pretty quickly followed by feet! If you’re a little like me, still wavering on the brink of sci fi, if you like a bit of a mystery with a few twists and a fun character then give this a whirl. 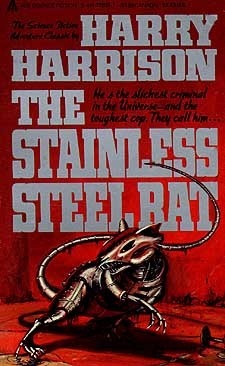 9 Responses to "The Stainless Steel Rat by Harry Harrison, a Guest Post by Lynn of Lynn’s Book Blog"
Perhaps you should discuss his satirical aims… It’s definitely as pastiche of the pulp hero. Paul is indeed correct there. I’m so happy that you read and enjoyed this. The three novels which make up the book shown in your final image, The Adventures of the Stainless Steel Rat, remain among my favorites. I first read them in that volume and the three novels tie together quite nicely into an overall story. The sequels and prequels have varying levels of quality, but these first three are a delight. It is easy to see how a kid like me, who was 9 when Star Wars was released, could get hooked on a roguish character like Slippery Jim DiGriz. I can still picture exactly where I was when I opened the book for the first time and got lost in its pages. I am taken back to that time every time I read the book. It is like my own personal time machine. 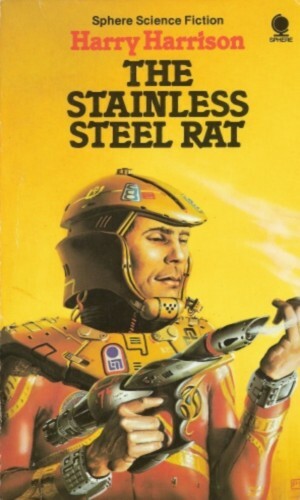 The Adventures of the Stainless Steel Rat are truly comfort reading for me now. If every anything is going wrong or I’m just burnt out on what I’m reading I can always go spend some time with Jim and be refreshed. Great post about your experience, Lynn. Thanks Carl. I’m definitely planning on reading the next two books. I really enjoyed this. It’s good to have your own ‘comfort’ book that you can just dip in and out of.